Having stood patiently in line, it was as if I’d uttered a magical password for hypnotic recall. Behind the Avis desk at Glasgow International Airport – negotiating the release of a stupidly inappropriate Mercedes – a very amiable and hard-working lady named Karen paused and stared wistfully into the distance. 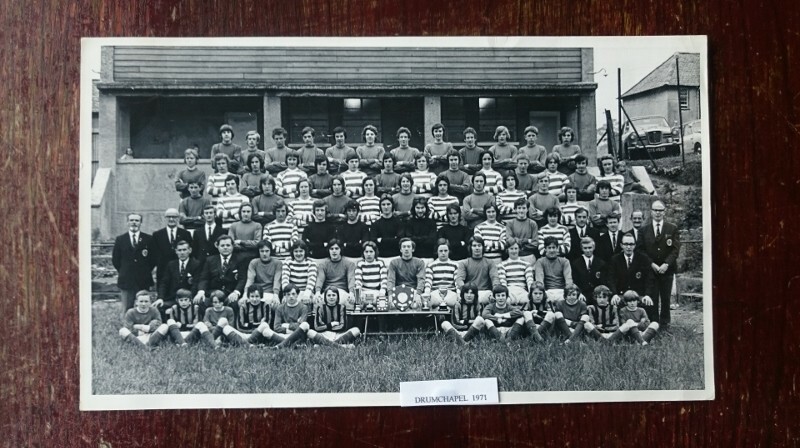 “Oh, my dad played for Drumchapel… many, many years ago.” She smiled before recounting some of the many more illustrious alumni that the club boasts “The list goes on and on… Oh, it’s such a special club… They got all their players through the Boys’ Brigade.” Snapping back into reality, she sighed “I’d talk all day about it, if there wasn’t this massive queue.” And there it was; my delightful welcome to Scotland and a small insight into the almost mythical world of Drumchapel Amateurs. Whether or not he was a descendent of BB founder Sir William Alexander Smith remains on my to-do list but, Arnott Young shipyard owner Douglas Smith (1/8/27 – 25/2/04) was also the Captain of the 1st Drumchapel Boys’ Brigade for 25 years. Without any doubt, Douglas’ passion for football lead to “his boys” turning out in two different leagues under two different associations. 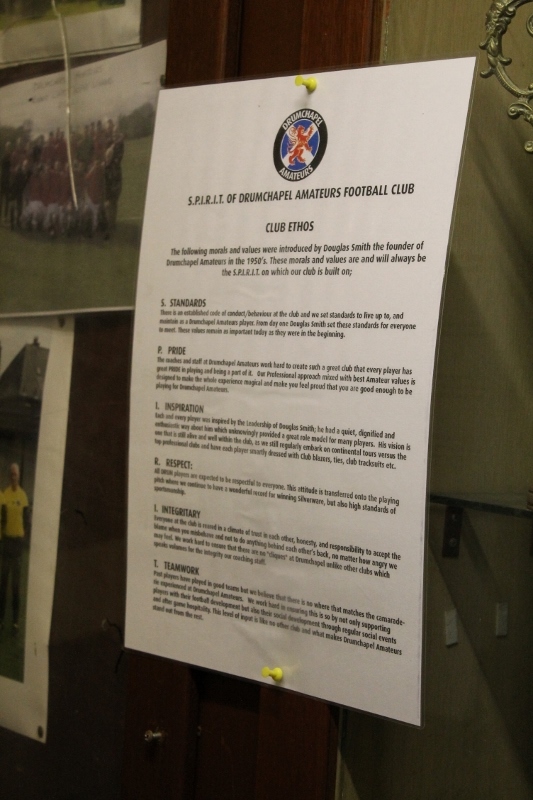 When summoned by SFA Secretary Willie Allan to explain such audacity, in 1950 Douglas established Drumchapel Amateurs and – implementing many Boys’ Brigade tenets – turned them into the benchmark for Scottish youth football. 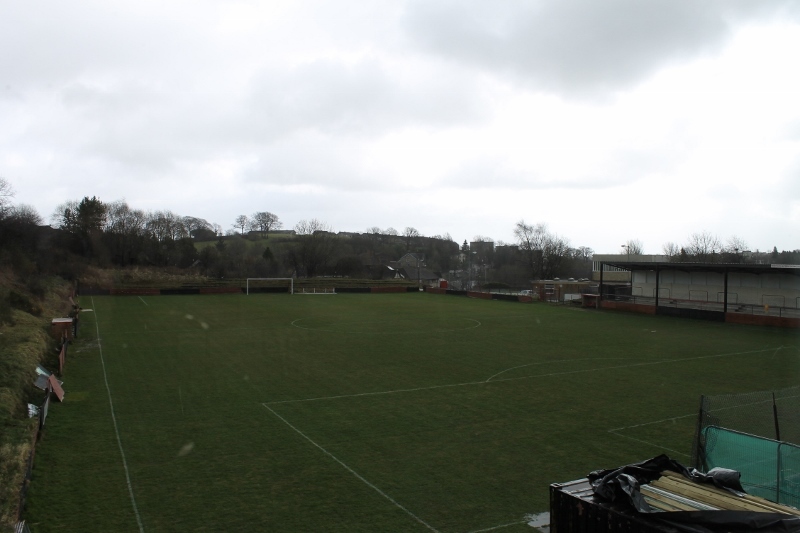 It had been raining throughout the night but an hour after leaving the Karen to her thoughts; I was sitting in the Drumchapel private members club over-looking Glenhead Park. With me Club President, Jim Wood (Keith’s former coach at The Drum), and Club Secretary, Charlie Devlin, waxed lyrical about club matters. 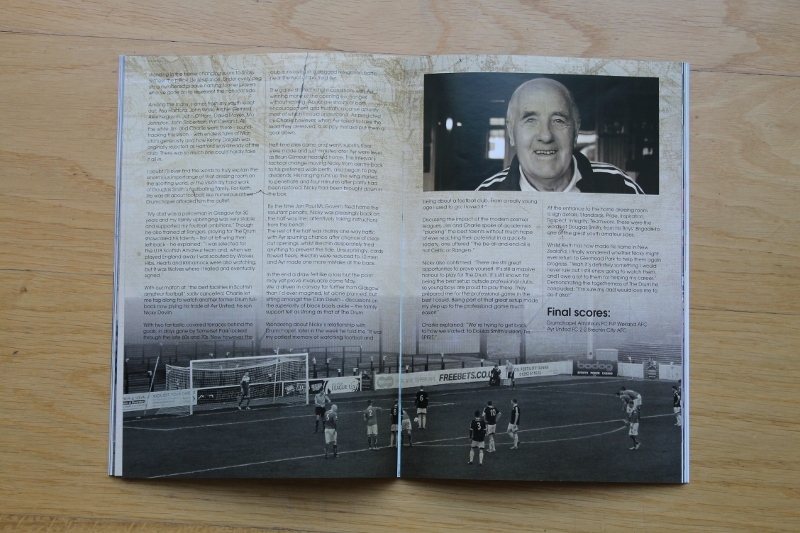 Then once the inquest into the cancelled game had subsided, a stack of old photos and club memories became our focus. The “lunch” was another Douglas Smith initiative. Held at Reid’s Tea Rooms, boys would be fed after their morning matches before being driven to Drum fixtures in the afternoon. Demonstrating their then status in the hierarchy of Scottish football, in the next room 1881 Scottish Cup winners, Queens Park, were doing exactly the same thing. 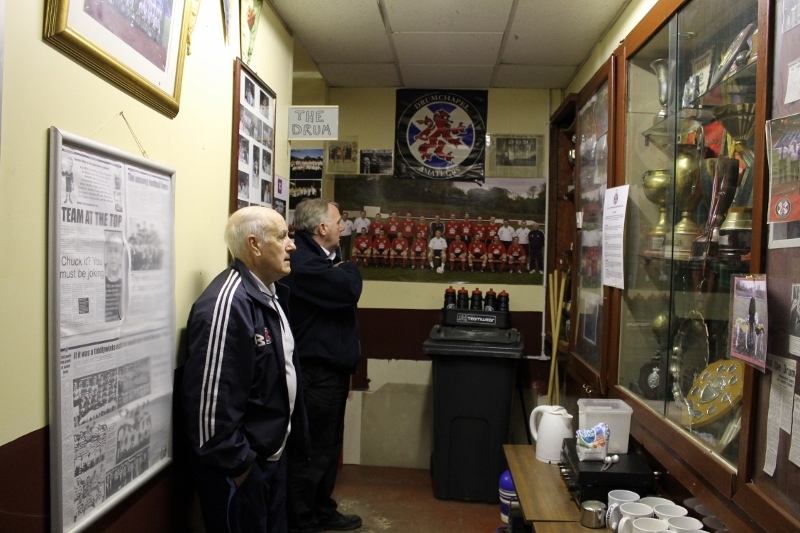 Whilst Douglas’ hand-written diaries and numerous photos helped fill in the blanks, in the corridors underneath us, the true magic of this club’s past exploded into life. Shelf upon shelf of trophies, pennants and programmes; signed memorabilia and team photos filled with countless household faces. There was evidence of numerous foreign tours – regularly facing the likes of Barcelona, Milan and Schalke – and then standing in the home changing room to finally witness the pièce de résistance. 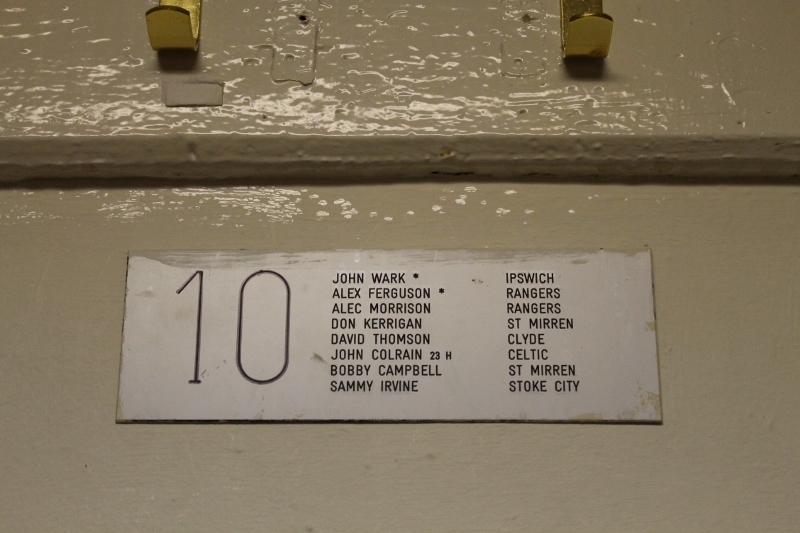 Under every peg sits a numbered plaque naming former players who’ve gone on to represent the national side. 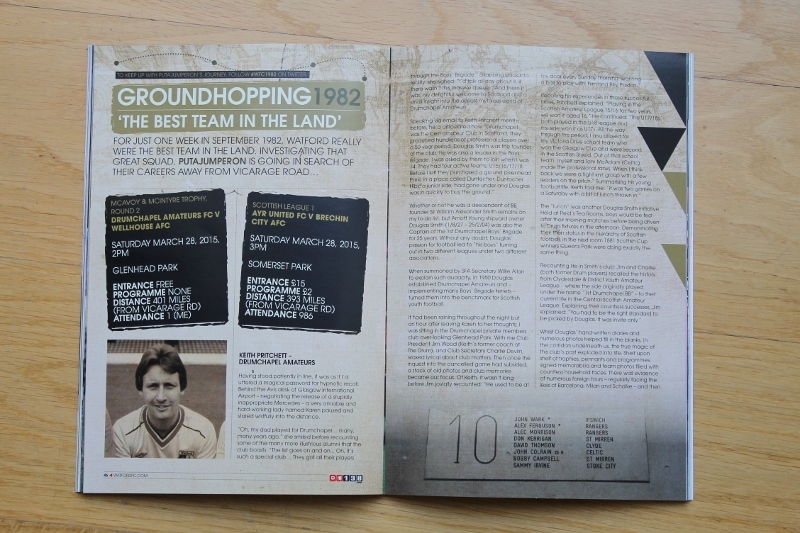 Among the many, names from my youth leapt out; Asa Hartford, John Wark, Archie Gemmill, Alex Ferguson, John O’Hare, David Moyes, Mo Johnston, John Robertson, Pat Crerand… All the while Jim and Charlie were there – sound-tracking this vision – with endless tales of Man Utd’s generosity and how Kenny Dalglish was originally rejected as Hartford was already at the club. There was so much one could hardly take it all in. 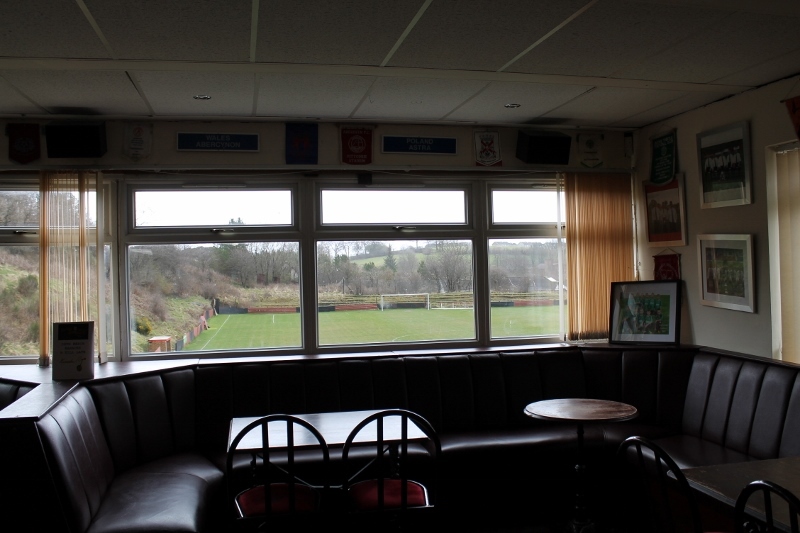 I doubt I’ll ever find the words to truly explain the enormous importance of that dressing room on the sporting world, or the visionary hard work of Douglas Smith’s footballing family. 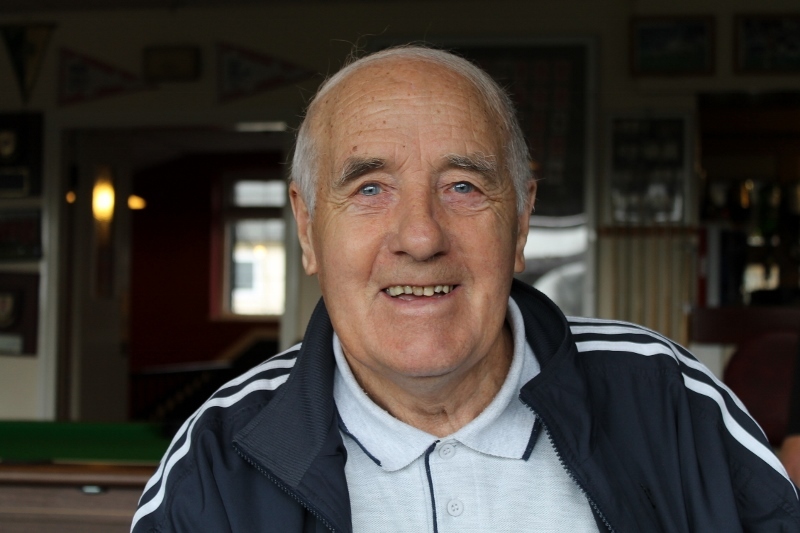 For Keith, life was all about football; like numerous others Drumchapel afforded him the outlet. With our match at “the best facilities in Scottish Amateur football” sadly cancelled, Charlie let me tag along to watch another former Drum full back now plying his trade at Ayr United; his son Nicky Devlin. With two fantastic covered terraces behind the goals; in days gone by Somerset Park rocked through the late 60s and 70s. Now however, the club is involved in a dogged relegation battle near the foot of the third tier. 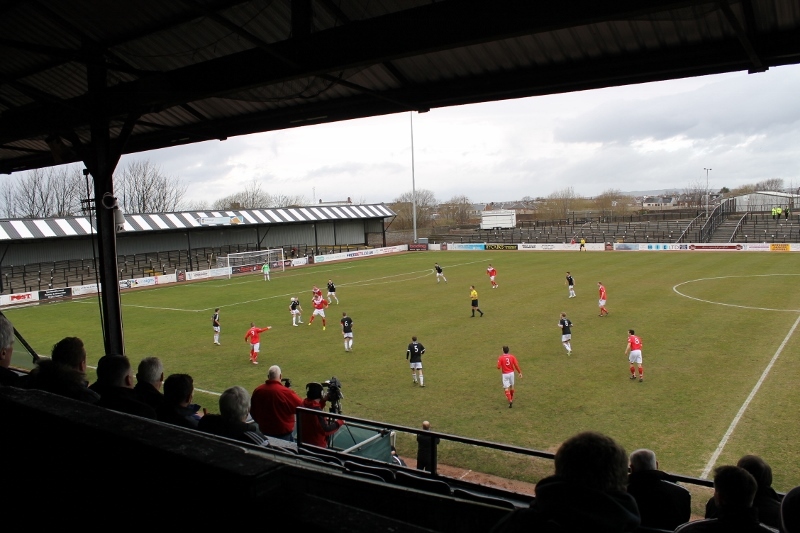 The game started in tight conditions with Ayr winning many of the opening exchanges without scoring. About me shouts of both encouragement and frustration came aplenty, most of which I could understand. As predicted by Charlie however, when Ayr failed to take the lead they deserved, a sloppy mistake put them a goal down. Half time pies came and went, substitutions were made and just minutes later Ayr were level as Brian Gilmour headed home. The interval’s tactical change moving Nicky from centre back to his preferred wide berth, also began to pay dividends. His ranging runs up the wing started to penetrate and four minutes after parity had been restored, Nicky had been brought down in the box. By the time Jon Paul McGovern fired home the resultant penalty, Nicky was pleasingly back on the half way line; attentively taking instructions from the bench. In the end a draw felt like a loss but the point may yet prove invaluable come May. 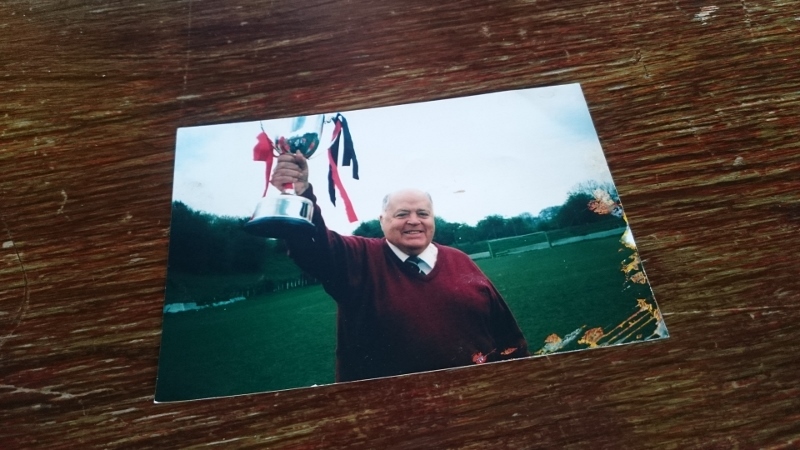 We’d driven in convoy far further from Glasgow than I’d ever imagined let alone planned but, sitting amongst the Clan Devlin – discussions on the superiority of black boots aside – the family support felt as strong as that of The Drum. 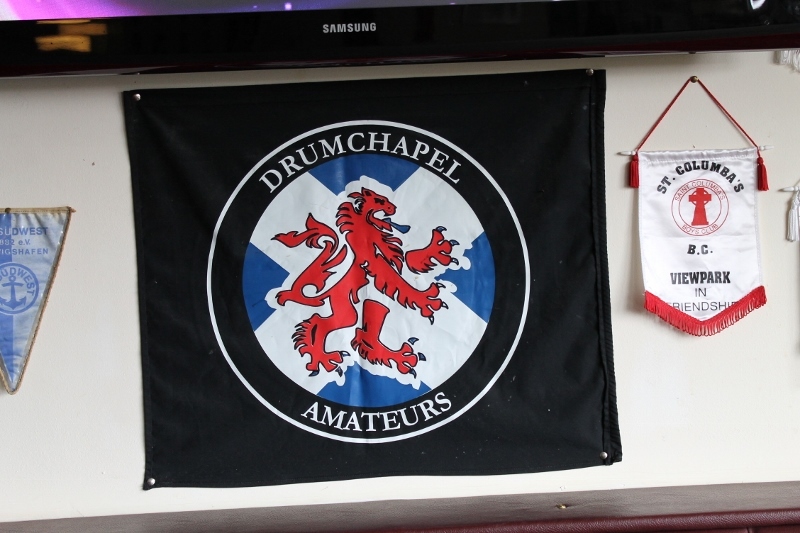 This entry was posted in #WFC1982, 2014-2015, McAvoy & McIntyre Trophy, Scottish League 1 and tagged 1st Drumchapel, Ayr United FC, Boys’ Brigade, Brechin City AFC, Central Scottish Amateur League, Charlie Devlin, Clydesdale & District Youth Amateur League, Douglas Smith, Drumchapel Amateurs FC, Duntocher, Duntocher Hibernian, Duntocher Hibs, Glasgow Cup, Glenhead Park, Jim Wood, Keith Pritchett, McAvoy & McIntyre Trophy, Nicky Devlin, Queen's Park FC, Reid’s Tea Rooms, Scottish League 1, Scottish Shield, SFA, Sir William Alexander Smith, Somerset Park, The Drum, Tom McAdam, Watford FC, Wellhouse AFC, William Alexander Smith, Willie Allan. Bookmark the permalink.